Warren County's Scott's Mountain, so named since at least 1885, is known locally as Montana Mountain, named for the small hamlet that sits on its scenic plateau. 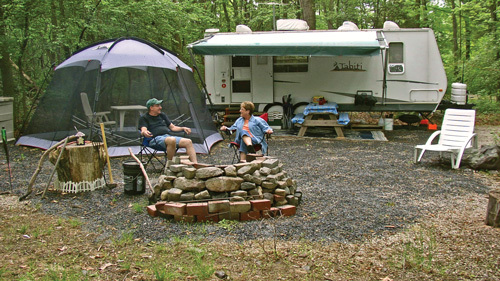 Nearby Merrill Creek Reservoir, with its vast open waters and network of wooded trails, is deserving of any excursion up the mountain. 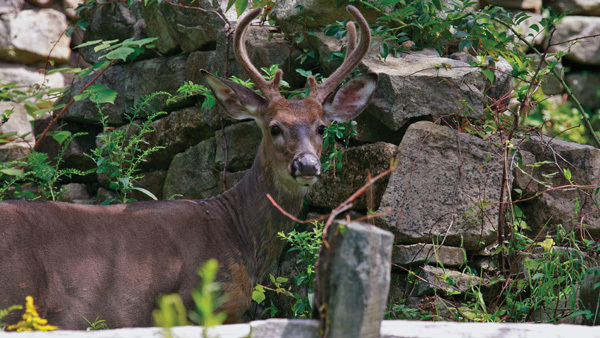 The trip back down into and through the Pohatcong Valley is equally rewarding for students of history and devotees of the outdoors. There's always something to see from the observation area at Merrill Creek's inlet/outlet tower. There is a small green sign pointing up to Merrill Creek at Fox Farm Road, just south of the Warren County Fairgrounds, on the other side of County Route 519 in Harmony. Turn up narrow Fox Farm Road and follow it up Montana Mountain, bearing right in about a mile. Then look for the gravel lane on the right in another half-mile, and a gated, unpaved parking area. In the mid-1980s New Jersey's largest one-day count of migrating fall raptors was recorded nearby; an amazing 18,500 broadwing hawks! And around the same time, visitors may have noticed huge excavating machines in the distance reshaping a natural geological basin into the final contour of what would become the 650-acre Merrill Creek Reservoir. Water would be pumped up from the Delaware River three miles west, to be contained by a half-mile-long, 235-foot high dam constructed in narrow Low's Hollow gorge a thousand yards ahead, and kept available for release back to the river at times of low flow. Merrill Creek originally entered the mountaintop basin from the plateau to the north, then flowed southerly for nearly two miles before escaping into Low's Hollow. But the 1980s project was not the first to impede the creek's progress. In 1903, to supply water for its new location at Phillipsburg, the Ingersoll-Rand Company built a ten-acre reservoir just upstream from the site of today's huge dam, which now hides the old thirty-foot high concrete barrier under two hundred feet of the reservoir's deepest waters. 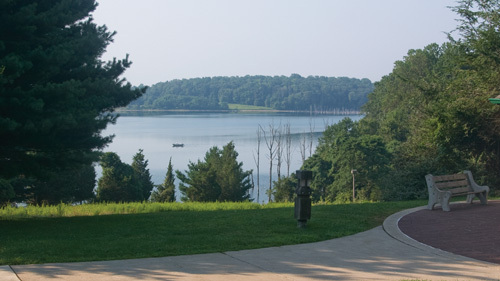 The 2,300-acre property surrounding Merrill Creek Reservoir holds a large network of trails worthy of exploration, including a 290-acre environmental preserve. 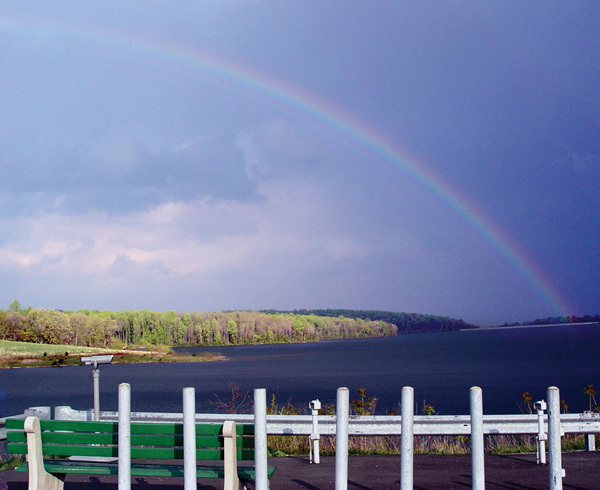 From the unpaved parking area, hikers, runners, and nature lovers can follow the gated lane down to the five-mile-long perimeter trail which skirts the reservoir. Hiking counterclockwise leads over the main dam and its scenic vista overlooking Low's Hollow. Heading in the other direction, the perimeter trail passes a spur trail which heads down to a wildlife observation deck at water's edge. Few visitors realize, though, that the Fox Farm Road once continued down the basin's steep western side, passing the sites of old family farms and a schoolhouse, now deep under water. Four narrow roads met at the bottom of the basin after descending its steep sides from the four points of the compass, at a place called Pleasant Hollow. After the Ingersoll reservoir was completed, the Lopatcong Water Company gradually bought out most of the land within the basin, planting large stands of conifers in the abandoned fields and clear-cut wood lots, some of which are still visible. Back then, Pleasant Hollow's aura was one of beauty and mystery. A descent into the basin through row after row of tall, dark evergreens provided a romantic setting by which to dally at the water's edge of Ingersoll reservoir at the bottom. And below the old dam, Merrill Creek flowed freely again, plunging down its tree-lined gorge into the hollow. From the gravel parking area, continue north on today's rerouted Fox Farm Road. After about a mile, a gated old road seen on the left once led uphill and continued along the mountain's broad flat top to the hamlet of Montana. Just beyond the old road, look carefully on the right for a black-topped lane leading up to a paved parking area. Here the reservoir's inlet-outlet tower handles the Delaware River water as it is taken in or released from the reservoir. This area is also the current site of the Scott's Mountain Hawk Watch from September through November, where thousands of hawks pass over along a major raptor migration flyway. The most popular are the broadwing hawks which fly over in huge groups, so high you'll need binoculars or a spotting scope to see most of them. The reservoir has hosted a pair of nesting bald eagles for more than a decade, and hundreds of observers have watched the royal birds, the growth and antics of the fledglings, and their interaction with other wildlife. You might see an eagle plucking a meal of fresh duck off the water's surface. Or watch an eagle suddenly fly toward an osprey as it tries to quickly escape with its newly-caught fish, snatching it in mid-air drop. A bear has been spied at least once swimming across a narrow part of the reservoir. Bucks, does, and fawns frequent the meadow across the water, and harriers are common as the day's light fades, sweeping low across the open meadow hunting for prey. There are dozens of duck species, snow geese by the tens of thousands, even occassional loons have been spotted here. And the snowy owl appearance last winter was the talk of New Jersey. The perimeter trail may also be accessed here, and fishing is allowed from the shoreline. Merrill Creek boat launch near the Visitor Center. Back on Fox Farm Road, continue for a mile and a half and turn right on Richline Road. You might see a resident black bear or two at the small bridge over a marshy portion of Merrill Creek. Continue and then turn right onto Merrill Creek Road, the most easterly of the old roads which once led into the now-flooded basin. Continue past the Visitor Center entrance drive until the road ends at the boat launch. 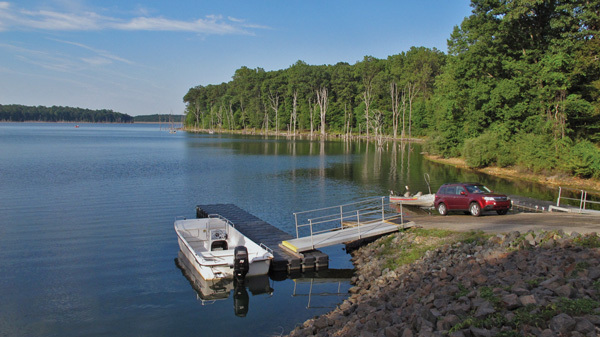 While canoes, kayaks, and fishing boats with small electric motors may be on the water generally from dawn to dusk, check Merrill Creek Reservoir's website for the exact hours of ramp operation. Over the years some of Merrill Creek's staff have led kayak and canoe nature tours of the reservoir, the most intriguing being their moonlight paddles (the only exception to the dawn to dusk rule). The visitor center offers great views over the water. Photographers love wildlife blinds like the one at the former upper Beers farm. Retrace the route, turning left toward the Visitor Center. In a short distance, notice the gravel lane on the right that leads back to a wildlife observation blind located on a former homestead, the upper Beers farm. Other portions of MCR's trail network may be accessed from here. Inside the Visitor Center there are various informative nature and historical displays, a lecture hall with many raptor and wildlife mounts, classroom, bird feeder observation window, and restrooms. 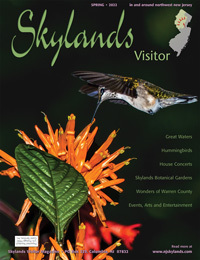 Brochures are available, including a detailed map of the nature preserve's color-coded trails. Trails leading from the Visitor Center take hikers along the water's edge on the perimeter trail, through forests, old conifer stands, and quiet trickling streams. One trail passes alongside the old farm ruins of the Cathers and Shafers families, including building foundations and a limestone kiln. A bit farther on, there is another wildlife blind along the water's edge. From the Visitors Center, return to Richline Road then turn right and continue to its intersection with Montana Road. Less than a half-mile to the right you'll notice a beautifully restored private (please do not enter) home known to local historians as Smith's Quaker meeting house. Research has shown that in 1752-3 Samuel Smith was granted the right by the Kingwood Meeting to build a Quaker meeting house and residence here in which he would hold services. 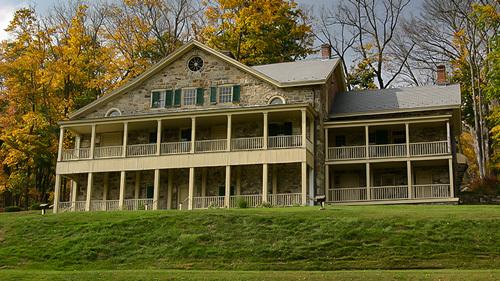 Quaker ownership continued for decades after. Turn left onto Montana Road, then continue for a mile and a half as it passes by the other end of Allens Mills Road and heads toward the small hamlet of Montana. This picturesque plateau is enhanced by the small former one-room school house and nearby small church. Until about 1860 the hamlet was called Springtown, and then Springville until the 1870s when it became known as Montana, perhaps because it is the highest elevated town in Warren County. Montana once held a cluster of homesteads, a Presbyterian church, a Baptist church, schoolhouse, blacksmith shop, store and post office. The two original churches are gone but the Methodist church, built in 1891, as well as a cluster of houses still exist today. At least three ancient roads led to or from the hamlet, one of them having been constructed around the time of the Revolutionary War. Turn right onto Millbrook Road. Follow it for three miles as it twists and turns downward through beautiful terrain. It will pass over the old Morris Canal just before the traffic light at Route 57 in the village of Broadway, so-named since at least 1856. This is the valley of the Pohatcong Creek, a corridor of commerce and transportation from Washington to Phillipsburg for more than a century and a half. Route 57, which follows a very old road alignment from the early 1770s, was authorized as a Turnpike as early as 1806, and has been designated a Warren Heritage Scenic Byway. The Morris Canal ran its boats through this little valley and across the state for a century from the 1820s on. From about 1906 the trolley tracks of the Easton & Washington Traction Company ran along Route 57, carrying passengers between Washington and Phillipsburg for 25 cents. And the Delaware, Lackawanna & Western railroad carried freight and passengers through here for many years. 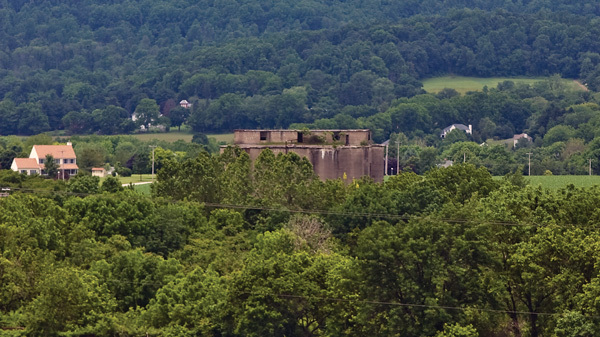 The remains of Thomas Edison's gigantic cement plant still dominate this view of the Pohatcong Valley, looking back from Good Springs Road towards Montana Mountain. Continue across Route 57, cross the Pohatcong Creek and in less than a mile, just before turning right onto Good Springs Road, an 1874 map shows a depot at the rail crossing. Follow Good Springs Road which parallels the valley of the Pohatcong Creek on the right. After about a mile it is easy to see the very large buildings which house thousands of chickens at the Ise Farms egg production facility. Nearby, to the left of the huge Ise Farms silo, lay the vast ruins of Thomas Edison's Portland Cement Company mill, now overgrown and obscured by brush, vines, and trees. Even the tall cluster of Edison's cement silos are partly hidden as nature reclaims its territory. During the late 1890s, hoping to turn a profit from his iron ore mine in northern New Jersey, Thomas Edison developed and used his own iron ore milling process. However, after the price of iron dropped, he sustained huge financial losses and abandoned his ore processing efforts. When cement rock was discovered near New Village, NJ in 1898, he saw a way to utilize his expensive ore crushing equipment. He bought land here, and began construction of the cement mill by 1901, with quarrying operations at Oxford, more recently the Tilcon quarry. By 1903 the plant was producing 3,000 barrels daily, although not without some glitches. In 1903 a coal dust explosion at the mill killed eight workers including the chief engineer. By 1911 the mill had the capacity to produce 2,500,000 barrels of Edison Portland cement annually. Ironically, because Edison licensed the use of his kilns to other manufacturers, cement overproduction affected profits to the industry in general. Although his Portland cement was used for buildings, roads, dams, and other structures, including the 1923 construction of Yankee Stadium, Edison's New Village plant was never very profitable. His involvement, however, certainly helped promote the growth of the young industry. Turn left on Route 57 and continue through New Village, which in 1918 held a population of 250 people, had the trolley, railroad, post office, school, two churches, and telephone. Edison's cement mill employed 600 men, mostly immigrants, the majority of whom commuted daily by trolley from Phillipsburg, Easton and Washington. In one mile, turn left into the lane leading to Bread Lock Park and Warren County Historical Learning Center, which, at the site of the former Morris Canal Lock 7 West, contains a short section of cleared canal towpath and prism, a perimeter walking and nature trail, and extensive historical signage. The remains of the lock are still buried, but the lock tender's house foundation, as well as a full-scale model of a canal boat, give visitors a glimpse into canal life. Inside the Learning Center, open on the second Sunday of each month, there are detailed models of the canal as well as other exhibits. 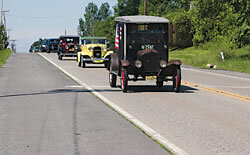 A parade of antique cars down the Concrete Highway opened the One-Hundred Year Anniversary celebration of the road's construction in June, 2012. Return to Route 57 and turn left to travel the Concrete Mile. As Edison built his concrete business, he constantly sought new ways to use his product. In 1912 an experimental section of highway was constructed with cement manufactured at his plant, perhaps the first paved road in rural America, and certainly the first concrete surface in New Jersey. 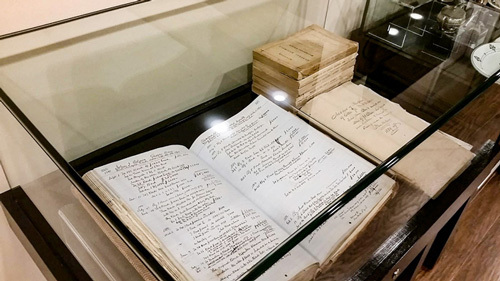 Although Edison's original concrete has since been replaced—the last of it finally pulled up in 2010—the segment proved quite sturdy, and concrete went on to play a major role in the construction of the U.S. Interstate Highway System. A historical marker documents the stretch of road. Beyond the Concrete Mile, turn right and follow Richline Hill Road to the stop sign, then turn right onto Reservoir Road, which follows Merrill Creek up through Low's Hollow to a cul-de-sac. Continuing past the gate on foot for a few hundred yards leads to the base of Merrill Creek Reservoir's main dam. No one is permitted on the dam, but steep trails in the woods on either side lead up to a scenic view at the top. Ready for more? Follow Reservoir Road and then Low's Hollow Road back down to Route 57. To view another of Thomas Edison's impressive influences on the area, head into the Valley View neighborhood in Phillipsburg. Follow Route 57 to its end, merge with Route 22 and turn onto the Roseberry Street exit. Turn left onto Roseberry Street, continuing across Route 22 on Roseberry Street which then skirts the former Ingersoll-Rand tract on the left. Ingersoll-Rand began construction of its complex in 1903, where it eventually employed two thousand workers, producing pumps, rock drills, jackhammers, compressors, and mining equipment. It was Phillipsburg's largest employer through the 1960s, then declined in stages until the company sold the property in 2004. After Roseberry Street bends into Center Street turn left onto Green Street, then in a few blocks turn left onto Congress Street and into the Valley View neighborhood, one like any other neighborhood, except for its homes made with concrete. (Please respect the residents' privacy and safety.) Using molds to form concrete houses may have been radical in the early 1900s, but it was not a new idea when Edison announced his plan in 1906 to construct houses of poured concrete. He wanted to modify earlier, hand-shoveled techniques by casting complete houses—interior walls, floors, and roof—in reusable cast iron or steel molds loaded from the top. But the cast iron molds proved to be too heavy to be purchased and handled economically. He announced that he would give away the patented design to qualified builders, presumably to boost sales of his concrete made with New Village Portland cement. If you visit the Valley View neighborhood, you'll notice a small market and deli at the top of the hill. This building, once the Ingersoll Rand company store, is now called Gino's, for its proprietor since the early 1970s. 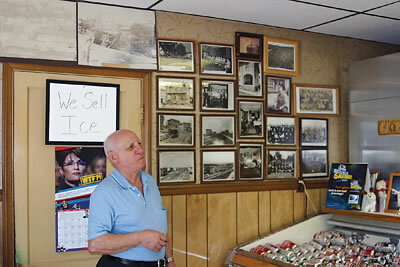 Gino knows a lot about his neighborhood, and in the back of his store he displays a collection of historic photos, news clippings, and other amazing documents. He's there most days, and if you ask about the concrete houses and where they came from, he'll be happy to chat and maybe show you some pictures. Plus, Gino makes a great sandwich. 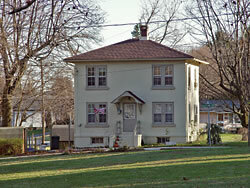 To ease the situation for its employees during the post-World War I housing shortage, the Ingersoll-Rand Company decided to build low cost workers' homes in two developments: Valley View, for semiskilled and unskilled workers; and Hill Crest, for department heads, foremen, supervisors, and highly skilled mechanics. In 1918, the nonprofit Phillipsburg Development Corp., a subsidiary to Ingersoll-Rand, began to implement the housing project, modeled after the attractive concrete homes erected by Charles H. Ingersoll in Union, NJ, a year earlier. (C. H. Ingersoll bore no relationship to the Ingersoll-Rand Company but was of Ingersoll Dollar Watch fame, later Timex.) Charles Ingersoll had improved upon Edison's casting method by using lighter, more economical wooden forms and by eliminating the need for top forms for the floors. Partly because the cement industries were nearby— F.M. Coogan, an executive of Alpha Portland Cement Co. was the development corporation's president—it was decided that the hundred or so houses of Valley View would rise using the "Ingersoll Method". 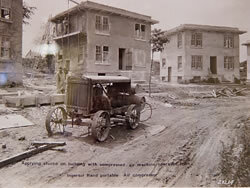 Concrete homes constructed at Valley View in Phillipsburg for Ingeroll-Rand employees in the early twentieth century still stand today. Because housing was so critical, the first twenty-five homes in Valley View, those on Congress Street, were built as conventional frame houses, due to the initial logistics of constructing and erecting the concrete forms. Although the first Valley View concrete houses had only four rooms, the rest had six rooms, and both types had modern bathrooms and basements, all cast in one operation. Group garages were located within the community as were a community center and grocery store. Initially, potential buyers were reluctant to live in concrete houses, believing they would be cold and damp. But as the houses were completed and occupied, their comfortable nature eased those fears. Except for the addition of sloped roofs on most of them, the homes still stand as they were built, relatively maintenance-free. From the top of the mountain to the bottom of the valley it's fascinating to learn how big names, and not so big names, intertwine with each other, affecting each other's lives in marvelous ways but which all too soon are forgotten. Comments and questions are welcomed and may be addressed to the author.